While visiting with Meakin and Sam (My Carolina Kitchen) at their home in Florida, Meakin mentioned that Sam had won a cooking contest with a fish dish and after we got home, she sent us the recipe. Want to see a shot of Sam in her younger days, check out the bottom photo in her 8/25/09 post. The title of her dish is Fish Provencale with Tumeric Rice and I believe she may have used catfish, but we used the crappie that is nearly always in the freezer and served it over turmeric couscous as that’s what we had – I wanted to use orzo. I don’t believe Sam has ever blogged about this dish, so I won’t publish the recipe but it contains the sautéed fish and a sauce of tomatoes, garlic, white wine, olives, corn starch, and herbs. I added all of the sauce ingredients to a bowl an hour ahead of time so the dried herbs could re-hydrate a little and begin flavoring the tomatoes then cooked it in a saucepan. The fish just got a dusting of flour and S&P and a quick fry in vegetable oil. We cooked the couscous per package directions but added extra butter and the turmeric. This was my plate – Bev decided a little grated parmesan was in order. Bev and I both thought it was delicious and understand why it was a prize winner – thanks for sharing the recipe Sam. A couple of cooks notes – if you use couscous, the sauce needs more liquid to help out it’s dry nature or if you’re married to a sauce-a-holic, as I am, you may need more sauce period. And if using the larger Kalamata olives, we would halve them to spread the flavor around more. If you think you'd like to try it, you might be able to get the recipe from Sam with a little sweet talking. Photos best if enlarged by clicking on them. With Madison gone to California for the holidays, Bev and I decided we would be into the bah-humbug mode and do virtually nothing for Christmas except relax. Madison ready to travel. Then we realized a couple of friends would be home alone and daughter Wende would be coming down. Then we remembered our neighbors had been wanting to get together and play some cards and all of a sudden, it was eight for dinner. However, we still decided to keep it simple by grilling some steaks, and siding them with Penny’s cheesy scalloped potatoes, a salad provided by one of the guests, and hot rolls. I had BBQ’d on Dec 22 and cooked some items for friends including smoking a rib roast. I just bought the whole rib eye, smoked his 10” piece and cut the remainder into steaks and after adding a couple from the freezer we had plenty of meat. I couldn’t find a USDA grade on the package and feared I may have ended up with select, but after cutting the steaks, they looked more like prime. So I looked harder at the package and found the choice rating then did a little on line research and discovered Butchers Block is a Sysco (food service company) brand. In keeping with our plan, the steaks were simple – give them a not to heavy coat of Montreal Steak Seasoning on both sides and let them set on the kitchen counter for about four hours (don’t tell the food police). Grill over charcoal to either red or pink – that seems to be as close as I can get anymore and a couple of folks still had to trade, but everyone thought they were great. I will definitely be heading back for some more – even though I’m still trying to empty the freezer. We made Penny’s Cheesy Scalloped Potatoes for our friends meal a couple of weeks ago and liked them so well, we decided to have them again for Christmas – who doesn’t like cheesy potatoes. Her recipe is for two and since I adapted it for eight, I thought I’d post it on here so I can have a record of it. I just multiplied the ingredients by eight then amended the directions a little. Adjust oven rack to upper-middle position and heat oven to 425 degrees. Toss cheddar and 4 teaspoon cornstarch together in bowl until well combined. Toss Parmesan and remaining 2 teaspoon corn starch together in second bowl until well combined. Heat oil in 12-inch sauté pan over medium heat until shimmering, add onion and cook until lightly browned, about 15 minutes. Stir in garlic and thyme and cook until fragrant, about 60 seconds. Add broth, cream, potatoes, salt, and pepper and bring to boil. Reduce heat to medium-low, cover, and simmer until potatoes are nearly tender. Off heat, stir in cheddar mixture and press potatoes into even layer in a greased casserole dish. Sprinkle Parmesan mixture evenly over top and bake until golden brown and bubbly. Let potatoes cool on wire rack for 10 minutes. (I made the dish up early and added the Parmesan just before they went into the oven). I had a lot going on at serving time and didn’t get any finished shots so go back up and look at that raw meat again J. We finished up with dessert provided by one of the guests and had a couple of four-person card games – it was a very good way to spend Christmas day with much less work and anxiety than the usual big meal. Bev and I wish each of you a very Merry Christmas and the Happiest of New Year’s and I want to thank you for reading and commenting on my blog and for being my blogger buddy. We wanted to have friends, David and Laurie, over for dinner prior to Christmas and chose two blogger buddy recipes. The main course was Crisp Pork Cutlets with Lemon-Caper Sauce from the kitchen of One Perfect Bite and we sided it with our own Brussels sprouts recipe, and Cheesy Potatoes courtesy of Penny of Lake Lure Cottage Kitchen. Please check their sites for the recipes and photos. We began the meal with an appetizer plate that included marinated mozzarella, with the recipe calling for fresh parsley. We toss out lots of fresh herbs and I don’t know where I first heard this method (one of your blogs, TV, web, etc) to keep herbs fresh - click on this link to see it at Simply Recipes. Basically, just add them to a jar of water, cover with a plastic bag, making it tight around the jar, and store in the fridge (except basil). We used one of the vegetable bags from the market and just finished off this parsley, which was bought during our Florida trip three weeks earlier – I was flabbergasted and am very appreciative to whoever gave me this tip. I followed Mary's pork cutlet recipe and doubled it for eight pieces of meat. Rather than paper towels, I drained them on a wire rack and kept them warm in the warming drawer. 1. Steam sprouts until nearly done and cut large ones in half lengthwise. 2. Melt butter in a skillet and add garlic and lemon juice – cook garlic a few minutes. 3. Add sprouts and cook until done, tossing to evenly coat with butter mixture. 4. Add bacon, toss, and cook until bacon is warm. 5. Pour into serving bowl and top with grated parmesan. For the potatoes, we followed Penny’s recipe except we multiplied it by four and used a 12” sauté pan. The dark is where the cheese stuck so best to use a non-stick pan per the recipe - I really enjoyed cleaning the pan. This is the range in action, the sprouts went on when the potatoes went in the oven. We all enjoyed the meal – thanks Mary and Penny - and after it settled, we finished it off with pie and ice cream furnished by Laurie and David. I know, it doesn’t take much to excite an old man, but I’ve been admiring trip maps on other blogs and wishing I knew how to do it. Well, thanks to some help from Erin over at Two to Travels Phaeton Journeys, I was able to create a map of our recent western trip in Google Maps and actually have it end up on my blog – major achievement for this techno-challenged guy. I went back and added it to my trip wrap-up post. Yes the meal items are listed in the correct order as this post is about the fries. While we were on Marco island, we ate at three restaurants that all served the same (or very similar) fries that we thought we delicious. At the last little place, we were able to asked the owner about them and while there he got a delivery so I got to see the box. They were Lamb Weston Colossal Crispy Coat Cut Potato Fry. I assume they are only available from a food service supplier and in a 30# case, but in the meantime Bev bought a bag of these from Walmart – there brand. I wanted to try them and found a piece of the tail end of a beef tenderloin in the freezer and a meal was made. I added a light coat of Montreal Steak Seasoning and cooked the filet on the grill and thanks to my uneven heating grill I over-cooked the meat a little. I cooked the fries on the grill side burner in the recommended 360* oil for about four minutes, even though it was pretty cool outside – we have a 12 month grilling season at Almost Heaven South. We started the meal with one of Bev’s nice salads for a classic steakhouse meal and this is my plate - the hole is from the probe. A rarer steak would have been a little better, but we really liked the fries. They were very crispy when cooked and required no additional seasoning – not even salt. Without a side-by-side comparison, I can’t say if they were as good as those from Marco, but they were plenty good and readily available in small quantities. Since Walmart doesn’t manufacture coated fries, they may well be the same ones as the restaurants use. We don’t eat fries often, but these will be the new go-to version. Our neighbor, Steve, loves Salisbury steak but apparently only gets it via a TV dinner and since we also really like it, we decided to invite them down for our version. 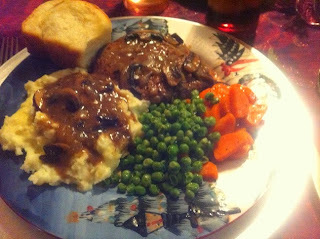 We once again used the recipe for SalisburySteak with Mushroom Gravy from Lynda’s Recipe Box – please stop by Lynda’s site for the recipe and photos. Before discussing the meal, here's a little history of the dish. It was named for Dr. James Henry Salisbury who encouraged it during the Civil War because he considered minced beef as health food. The term Salisbury steak was first recorded in 1897 but really came into full usage during World War I when patriotic Americans wanted a substitute for the German word hamburger. I followed Lynda's recipe except I made six 8 oz. steaks and a double recipe of gravy using both button and cremini mushrooms. We sided the steak with some Pioneer Woman mashed potatoes, buttered peas, buttered carrots, and hot rolls. I wanted to serve Steve's in a sectioned aluminum TV dinner tray, but didn't want to go to town and try to find them. We made the potatoes and gravy a little ahead of time and kept them warm on the cook top. I used a pot for the potatoes, a skillet for the gravy, two skillets to cook the meat and two pots for the veggies – steamed in a little seasoned chicken broth until tender then buttered. We rarely use all of the eyes on the range, but it's nice when we need them - this is just before the cooking started. This is the finished platter of steak and the extra gravy was served on the side. Just as I was ready to shoot my plate, the camera battery was dead and I resorted to Bev’s phone - I knew I needed to charge that thing occasionally. My meal looked even better than the shot of it shows. The meal was a success and Steve said it was the best TV dinner he’d ever eaten and I certainly agreed (I ate many as a kid and considered them and pot pies a treat). When I saw the recipe on Mary's blog for Pasta with Leftover Turkey Bolognese I knew I wanted to try it if we had the turkey leftovers as I was ready for some pasta. Please visit Mary's site for some great shots of hers. We made it per Mary's recipe but Bev wanted to kick it up a little with some pepperoni. 1. Heat a wide, heavy-duty 6 to 8-quart pot over medium heat. Add pancetta or bacon and pepperoni and cook until its fat renders some then remove about half of the fat. 2. Add carrot, onion, celery, and garlic and cook until vegetables begin to brown, 4 to 6 minutes. Stir in fennel seed and pepper flakes. 3. Add tomatoes and white wine. Boil for 2 to 3 minutes, then add broth, milk, parsley, and bay leaves. Stir well, return to a boil, and season with a little salt. Lower the heat to medium low and simmer until reduced by about one-third, 30 to 40 minutes. 4. Add turkey, raise heat to medium, and bring to a boil. Reduce heat to medium low and simmer until the flavors are fully developed and sauce is thick and rich, 10 to 15 minutes. Discard bay leaves and season to taste with salt. Yield: 5-1/2 cups sauce. Since the house was getting cleaned on meal day, we decided to make the sauce a day ahead then reheat and finish cooking it down when ready to use. 5. Cook pasta in boiling salted water according to package directions; drain. Toss the pasta with the bolognese and serve. Yield: 4 to 6 servings. The first shot is mine and the second is Bev's - she added fresh mozzarella and crushed red pepper to hers - I had mine like that the next day. We all thought it was very good and a good way to use the leftover turkey - even though we turned it into a less healthy dish. Thanks Mary for another fine meal. Before you could buy it in the grocery store and before polenta (Italian word) was a fashionable thing to serve, we made cornmeal mush and fried it – I assume it was a popular depression era food. The other day I suggested to Bev that we buy some of the packaged variety, but she quickly said she preferred homemade so off to the kitchen I went. Since my last couple of batches turned out too watery, I did a little web search to get the cornmeal to water proportions and the cooking time. I settled on this recipe from Taste Of Home. Boil 3 cups water and add salt. Combine well the remaining water with cornmeal (this will prevent lumping); add to boiling water. Stir until mixture returns to a boil. Reduce heat; cover and simmer for 1 hour, stirring occasionally (not a chance - see notes below). Pour into a greased 8-in. x 4-in. loaf pan (or line the pan with plastic wrap). Chill for 8 hours or overnight. After chilling run something around the edges to be sure it isn’t sticking then invert pan on a cutting board (or just lift it out by the plastic wrap but still invert as the crusty top side needs to be against the cutting board for slicing. Notes: The key to making this is the final water content and if made correctly, it’s a little bit rubbery and can be held by one end without pulling apart – mine passed this test. It can also be fried without flour to hold it together – it passed this test as well. However, don’t believe the second sentence in instruction 1 for a second – unless you want to jack hammer the stuck part from the bottom of the pan, it must be stirred very often. I left the lid off and cooked it for 45 minutes enjoying the little volcano’s of steam as they erupted. I usually try to make it when I’m in the kitchen doing something else – making pasta sauce in this case. To serve, cut into 1/2-in. thick slices and fry in hot oil (I like some bacon grease with the oil). Fry to a golden brown, flip and repeat – remove and drain on paper towels for a couple of minutes. Since it really likes to stick to the pan, I always use a non-stick skillet. When I was a kid, we ate it open faced on a piece of buttered white bread, making it a bread sandwich, but this time, I topped mine with a couple of fried eggs and it was delicious. I used some whole grain corn meal that I’d bought from a farmer at a fair and kept in the freezer and while it was very good, I still want to try the pre-made version to see if homemade is worth the effort. I think I’ve posted about mush before but wanted to provide the above tips and have them recorded on the blog - so I'll know what to do next time. While trying to store something in the pantry just before Thanksgiving, I noticed a box of Zatarains Creole Dirty Rice Mix that had been taking up space for a long time and I made a mental note to toss it later. Then, the next day I read the recipe from Chris at Nibble Me This, using the dirty rice and leftover turkey for one of his favorite soups. Since it was cold here after Thanksgiving and we had everything on-hand but the red kidney beans, we made up a batch. Please check Chris' blog for the original recipe and his usual great photo. 1. Preheat a stock pan over medium high heat and melt butter. Sauté veggies for 5 minutes, until starting to turn tender. Season with a little salt and pepper while sauteing. 2. Sprinkle in the flour and stir until blended into a light roux (about 1-3 minutes). 3. Whisk in 1-2 cups of broth gradually while constantly whisking until the roux is well combined into the liquid. Stir in the rest of the broth, bring to a boil, reduce heat and simmer for 20 minutes. 4. Stir in the Dirty Rice Mix and continue simmering for 25 more minutes. 5. Add the turkey, kidney beans, thyme and oregano and let simmer for 15-25 minutes longer. 6. Taste for seasoning and add salt and pepper as needed. Ours turned out a darker than Chris' as I used roasted turkey stock for the liquid. Bev said "this is good, actually, it's really good" and I agreed. So if you have a box of dirty rice mix taking up space at your place, you now have a use for it and if not, you may want to pick up a box and rotisserie chickens for an easy week-night meal. Thanks Chris for a delicious dinner. After missing the trip the previous week and hearing all about it, I was the first one in the car for the Wednesday morning visit to the local farmers market. The event is held November 6, 2013 - April 30, 2014 at one of the city parks and there were more than 100 vendors there selling produce, meat & fish, baked goods, arts and crafts, jewelry, other food items, ready to eat foods, and more. This is a shot down each of the two aisles. There were several produce booths, some with just veggies and some including fruit, and some just fruit. The baked goods booths were hard to walk by and we didn’t. This is the cheese place from which the Spanish Valdeon blue cheese came for last weeks salads and this time I bought provolone and another cheese whose name I forgot. I also bought 2# of home-made mozzarella from another vendor. I was impressed by the dolphin carvings. and the BBQ place where I bought my breakfast. While most of the stuff was as high or higher than in the store, it was also of higher quality and if I lived in Marco during the winter, I can imagine buying most of our food at the FM. I wanted to buy some meat and fish to take home but it was just too darned expensive - $19/lb for steak and grouper. I've not been to lots of FMs but this was the best I'd seen. We bought plenty of stuff considering we were leaving in three days and this may be our first trip where the car was more packed for the return trip from Marco. I can imagine that Wednesday is a pretty much of an off-day at the local Publix and Winn Dixie. After the market we headed over to Lee Be Fish Co. for an outstanding fish taco made with fresh grilled grouper and snapper. They used to be just a fish market, but began offering prepared food three years ago and while the menu is limited, what we tried was delicious. So that's it for this years trip to Marco Island with one last sunset and thanks for following along.